Bring a classic and all-natural look to your living spaces. 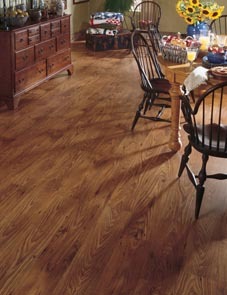 At Buddy's Flooring America, we believe beautiful flooring should come at a great price. That’s why we carry many different wood floor products at competitive prices. Whether you are looking for engineered or solid hardwood flooring in Miamisburg, OH, our showroom is sure to have something that satisfies your family’s floor needs. When you visit our store, our professionals get to know the specifics of your flooring requirements and work hard to pick a handful of options that best suit your tastes, budget, and lifestyle. Of course, you can also browse our selection on your own first to get a sense for the style and the options available to you. With all these resources at hand, you’re that much closer to bringing home the floors of your dreams. Many shoppers who choose wood floors do so because wood has a certain timeless appeal, but they don’t take into consideration just how varied wood can be. The wood flooring brands we stock come in many different colors, styles, stains, and grains, giving you a wider selection than you may have thought possible. This allows you to create a space that’s truly unique. Hardwood floors are a great option for spaces that have a lot of foot traffic because they are tough enough to last without much visible wear. They are also very easy to clean and maintain, ensuring the beauty you fell in love with at our hardwood flooring showroom will stay looking that great for years to come. Consult with our designers to find out what kind of hardwood is best for your home or business so you can get the most resilient floors and best value possible. Who says hardwood floors have to be expensive? When you visit our showroom, you can find a huge selection of solid and engineered hardwood at prices that match your budget. All our flooring options are more than simply affordable - they’re high-quality, so you can be sure they’ll last for decades in your home. Be sure to ask about professional installation once you’ve settled on a flooring option. We maintain relationships with many different contractors, so we can quickly connect you with an installation crew that can get the job done right. Contact our staff for more information about traditional and engineered hardwood flooring. We proudly serve residents of West Carrollton, Germantown, and Miamisburg, Ohio, as well as those in Franklin, Springboro, Centerville, and Oakwood.